Item Description: Defend against discomfort with a perfect addition to your seating lineup. 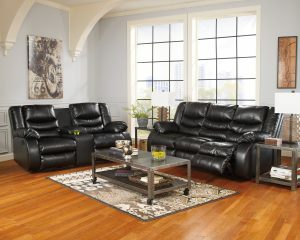 The Linebacker DuraBlend® reclining loveseat with console is handsomely built with strength and durability. Inner cushions and back are covered with luxurious DuraBlend leather which gives you the look of leather without the high price. Simply pull tabs to recline the two end seats. Note how the tufted back upholstery provides exceptional support for head and back. Rest arms on the thick padded armrests. Drinks, snacks and TV remotes are all within reach with the handy console. Now you’re a game player for relaxation in modern style. Item Features: Frame constructions have been rigorously tested to simulate the home and transportation environments for improved durability.. Corners are glued, blocked and stapled. Stripes and patterns are match cut. All fabrics are pre-approved for wearability and durability against AHFA standards. Cushion cores are constructed of low melt fiber wrapped over high quality foam. Features metal drop-in unitized seat box for strength and durability. All metal construction to the floor for strength and durability. The reclining mechanism features infinite positions for comfort. The console features storage and 2 cup holders.